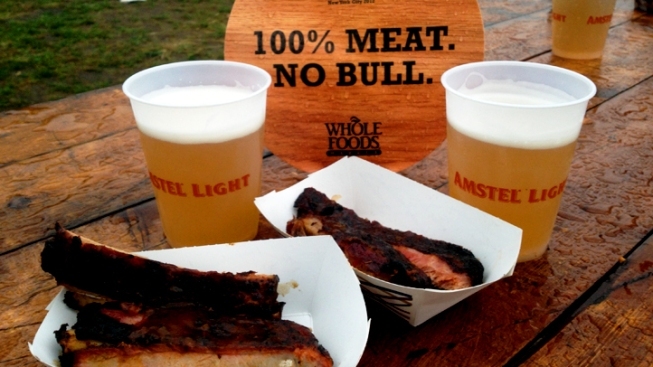 Last week on Randall's Island it was all about ... Meatopia. The all-you-can-eat meat and beer festival had the unfortunate luck of being scheduled on the same day as several tornados in the greater NYC area. As I was checking in to get my press pass, the staff attendants were informed to evacuate. Fortunately for the blogosphere, I simply turned around and walked into the festival. And goodness, I was glad I did. I am a carnivore. I've recently tried to move toward a greener diet, but Saturday was neither the time nor place for such trifles. Not when skin-on BBQ Jamaican jerk pork belly, whole Hampshire hog with spicy pepper seasoning, grilled “Vegas Strip” steak, and grilled venison steaks and marinated tenderloin were afoot! No, this was a day for the meats! The rain did not seem to lessen the line for Aaron Franklin's beef brisket, which had the longest line I saw. The brisket itself seemed to melt in my mouth, all the more impressive when I saw the huge slabs of brisket the sampling came from. I have to give a special shout out to Serafim Ferdeklis for their grilled seftalia and bifteki. The Greek samplings were delicious and hearty. Admittedly there was a lot of meat, and I found myself losing steam as the day went on. Thankfully at the Gabriele Corcos and Debi Mazar table, their pizza al carpaccio was light and refreshing, especially with the dash of sweet lemon. Much to my surprise, the best thing I tried all day was not the meat at all but the flavors from Jenis ice cream truck, where they were sampling their James-Beard-winning desserts. The Yazoo Sue, made with cherry-wood-smoked porter, bar nuts and a cayenne finish was unlike any ice cream I've ever tasted. After a day full of robust, lingering flavors, this sweet offering from Jenis was unexpected and satisfying. Meatopia was an extraordinarily delicious, and very filling, foray into Randall's Island. Despite the unfavorable weather, the attendance appeared to barely waver. I suspect the only ones not happy with Meatopia were the animals. The delicious, delicious animals.